The Victoria Racing Club trophy was presented by Neil Wilson, the director of Victoria Racing Club to the winning connections of Shinzen Ranger during a trackside event at Tokyo Racecourse. 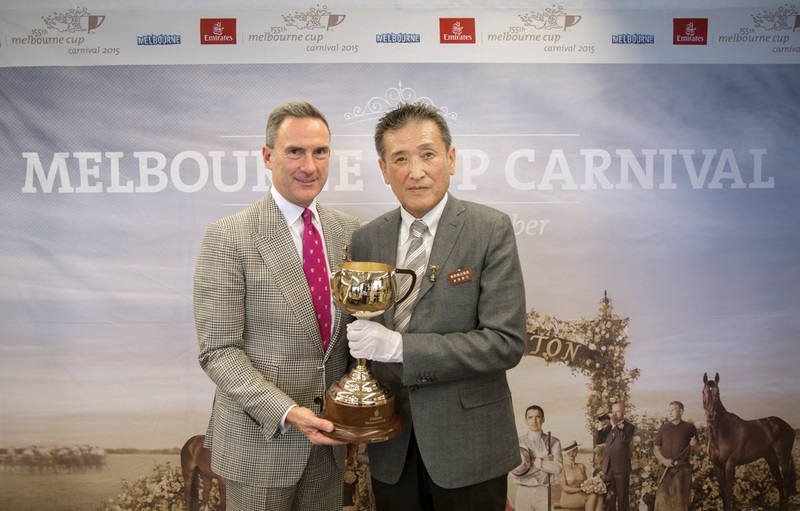 Meanwhile, the Japanese tour of the gold Cup included visits to the 2006 Emirates Melbourne Cup winner, Crown Oaks and Australian Guineas winner, Caulfield Cup champion and the Shadai Stallion Station. A millinery workshop was also held to highlight the importance of fashion to the Melbourne Cup Carnival. Architecture is the best example of the perfect synergy between artistic creativity and science. Balancing the cold practicalities of science and the flamboyance of art is no easy task but it is something Tony Battersby has been excelling in for many years. Essenze caught up with the talented architect to get an insight into the world of architecture and design. He joined SJB Architects back in 2000 and today, Tony Battersby is a director in the firm and has undertaken a variety of significant projects in both China and Australia. SJB traditionally designs luxury residences and today, the firm has moved to creating a large number of apartment projects that include the likes of a new 200m tower in the CBD as well as a recent golf resort, a number of hotels and a diverse range of intriguing and unique projects like the “bathroom of the future” for Kohler in Shanghai. According to the creative architect, one of the most challenging projects that SJB has taken on was a Country Club Resort in the Yarra Valley in Victoria. The resort was located on an elevated ridge, in bushfire territory where temperatures dropped below zero in winter. The resort covers a wide expanse that included a new golf clubhouse, hotel accommodation, day spa, pools, gym, cinema, conference room and banquet hall as well as member facilities. “It is a wonderfully inclusive range of everything we do!” he said. “The client and builder had a few arm-wrestles and I often needed to umpire or intervene with clever solutions,” Battersby shared. In the end, the project was a great success and Battersby believed he learned a great deal from the project and at the same time, made many lasting friendships on the job. It is projects like these that can define the professionalism and creativity of an architect. The year 2002 was the year when he first started a series of projects in China after winning some invited design competitions. Since then, he has visited dozens of provinces along the east coast, central and southern China to design a wide variety of projects including freeway gateway structures, toll plazas, service centres, hotels, resorts and most recently, shopping centres and retail districts. Naturally, along the way, Battersby picked up some Mandarin and he also tried to immerse himself in the local culture especially the particular district and province where his latest project is located. “I personally visited every single project site that I was commissioned to design and worked hard to understand the unique sense of place, history and aspirations for each of the project sites. My goal was to always leave a positive built environment outcome and a lasting and joyful design solution for any project that I worked on in China,” he said, adding that the experience he gained working in China had been a truly amazing one. SJB, which is celebrating its 40th year in Melbourne next year, now is known for delivering enduring design solutions that stand the test of time and also, creating joy for the inhabitants. “My designs focus on unique solutions because at SJB, we aspire to adopt a classic modern approach to design,” he said. SJB works with many private developers due to the firm’s approach to creating beautifully designed, well-built and feasible projects. This is a craft that the firm has built on and added to during its decades of experience and practice. SJB has worked with UAG, an Australian developer known for its elegant luxurious residential projects, on their three largest projects over the last few years. The projects included significant apartment projects, a variety of studio spaces and display suites. “UAG has provided us with great opportunities to create signature projects for them,” Battersby said. Naturally, it helps that he and UAG managing director Nicole Chow, who is also his wife, are on the same wavelength when it comes to design. “That makes the design process a joy and we are equally passionate about the quality and detail of every one of our projects,” he said. He said Nicole is particularly loyal to her team of consultants so they always try to keep a tight team of experienced professionals who are well versed with UAG’s particular requirements. UAG consistently pushes for innovative solutions and relentlessly challenges the design and delivery team to bring forth superbly designed buildings. “As a result, Nicole and her team usually sell a significant portion of every new project to repeat purchasers,” he said. Due to UAG’s insistence on aesthetically designed projects that are equally functional, Battersby said SJB is proud to continue on in this journey together with the UAG team in designing more elegantly outstanding projects.